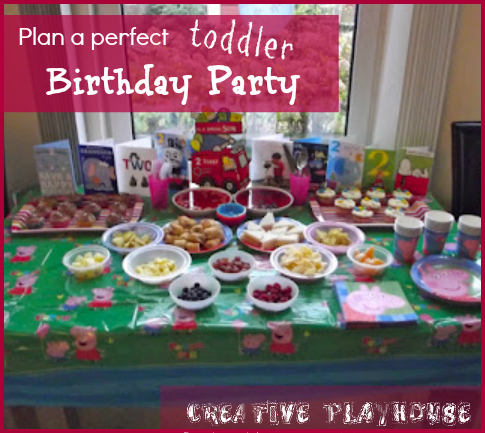 Jake's second birthday was 6 months ago, but lately I've seen lots of posts about wanting ideas for 1st and 2nd birthday parties and what food to serve, so I thought I'd share Jake's little party and my tips for a good party (below photos). left loads in a pile for Jake to dive into, kick around, and throw in the air! 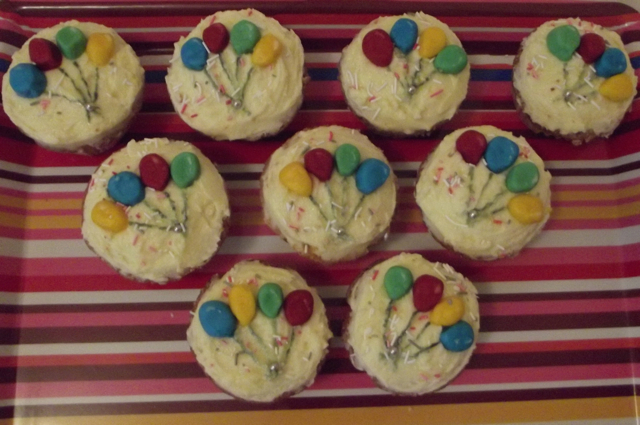 Balloon Cupcakes - just cos! 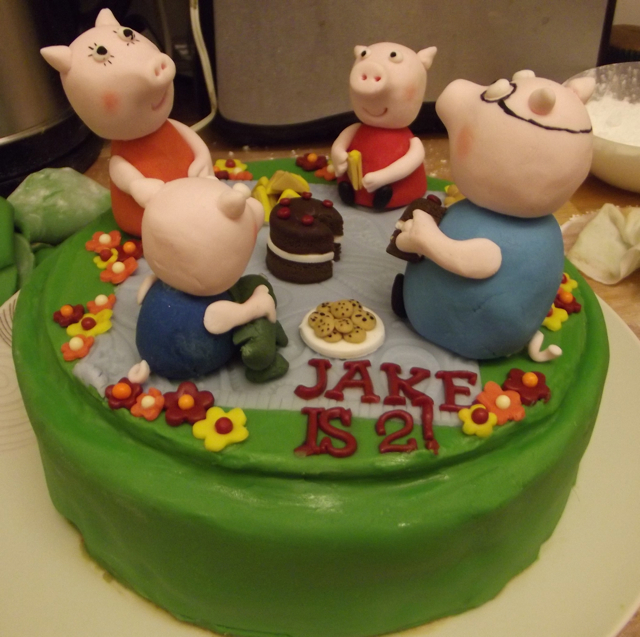 They took forever to make, but Jake loved them! 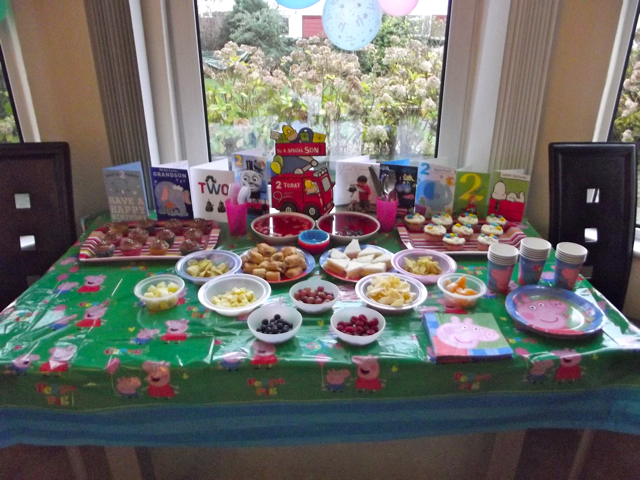 Peppa Pig blanket covered the coffee table to make a fun toy table for the kids! cups, serviettes, invitations and party bags. 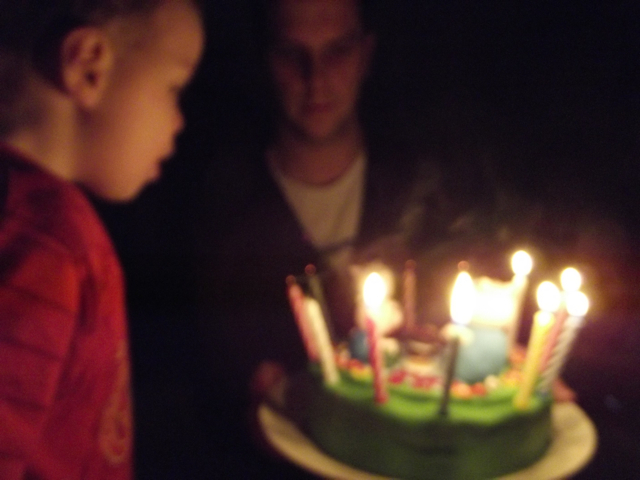 The centre of attention; blowing the candles out! Invitations - easy to make, get as a part of a party pack or even use facebook! 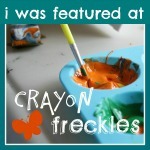 (there's a gazillion ideas for invitations on Pinterest). Get your invitations out early too! 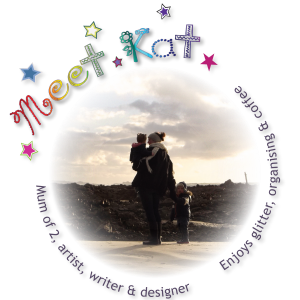 Guest List and Location - Think about how many little 'friends' you want to invite, take into account their parents and any siblings that will be joining them, and then any of your friends and family too. When you know how many people you want to invite you can decide whether to have the party at home or to hire a hall or other venue. The Cake - whether you want cupcakes or a big cake, chocolate gooeyness or a healthier banana bread, the cake is an important centrepiece that celebrates your child's special new age! If you're having your cake(s) made for you make sure you book in plenty of time as local cake makers can get quite busy. 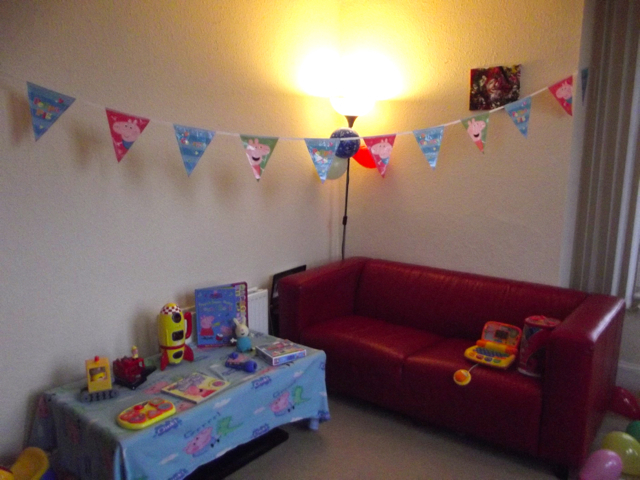 Decorations - balloons, bunting, table cloths, banners or whatever else you want. Choosing a theme or colour scheme can help the party space look amazing. Decorations are easy to make yourself or cheap to buy at pound shops and card shops. Food - planning the food can seem daunting, but you probably don't need as much as you think and it really doesn't need to be complicated. Things like berries and exotic fruits chopped up in bowls, jellies with fruit in, sausage rolls and mini sausages, mini pizzas, carrot, cherry tomatoes and cucumber sticks with a dip, sandwiches, and cheese all work well. Adults love kid's party food as much as they kids so you don't need to worry about anything fancy for the parents, but you might want to get some drinks in for them. Music - for toddlers you can either choose pop music or songs for TV shows, nursery rhymes, and traditional children's party songs. They probably won't take much notice and sometimes having it too loud can create a manic atmosphere so keeping it as background noise can work better. You can always turn it up for party games if you are doing them. 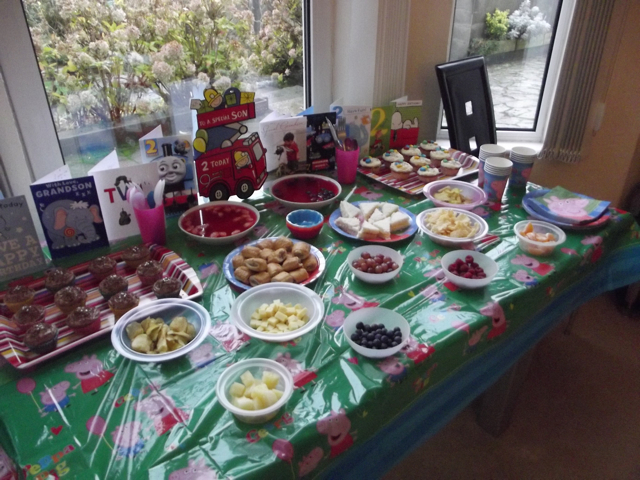 Games - there isn't a lot of point at a 2 year old's party, unless you have older children attending as well. Pass the parcel sort of works with lots of parent help. Things like musical bumps and statues are a bit too complex until they're 3, tho dancing is fun at any age. 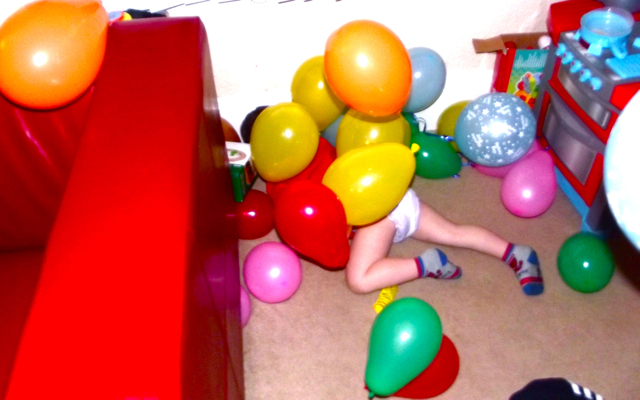 2 year olds are happy just 'being' and sometimes trying to enforce too much structure will cause more problems than fun! Party Bags - Im really not a fan of a lot of party bags; they tend to be full of rubbish plastic toys that don't get played with and sugar! For Jake's party bags I made some vanilla playdough and put some mini musical instruments in, a balloon and a mini pot of bubbles. 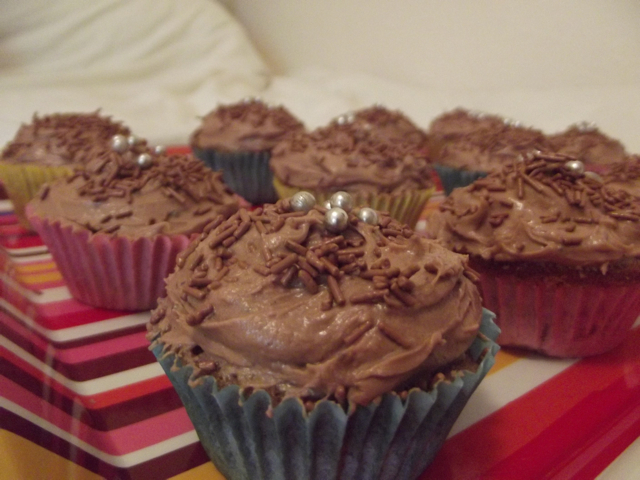 And of course some cake! Wooden toys are really lovely additions if you can afford them and again there are lots of good ideas for homemade party bag fillers on the net. Next year Ill be trying some of these out. Winding down - Its probably not something most people really think about before the party, but its a good idea to plan the party time so that you have enough time at the end to wind down before bedtime. 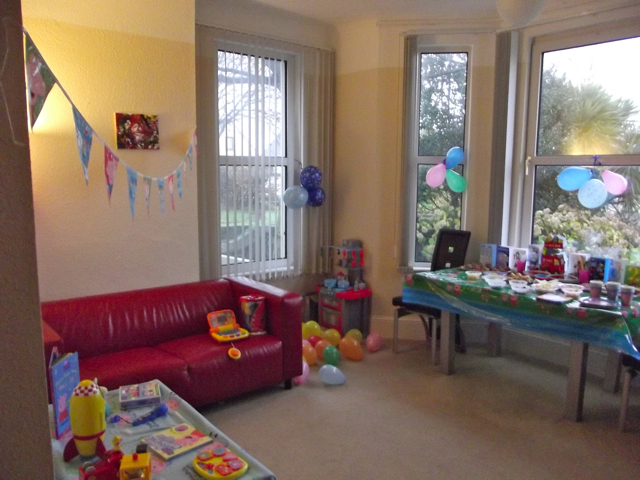 Parties can be highly stimulating for young children; they're busy and noisy, there is A LOT to look at, they are given lots of attention and presents and tend to eat foods that are higher in sugar than they might normally. Have the party finish at least a couple of hours before bed time, so your child can play with his toys by himself, have some quiet time with you, have a healthy snack or meal and a nice long relaxing bath. It will help you relax too and you will definitely want to - party days are BUSY and stressful no matter how well prepared you are! Jake loved his party. It was small, but perfect for him at this age. 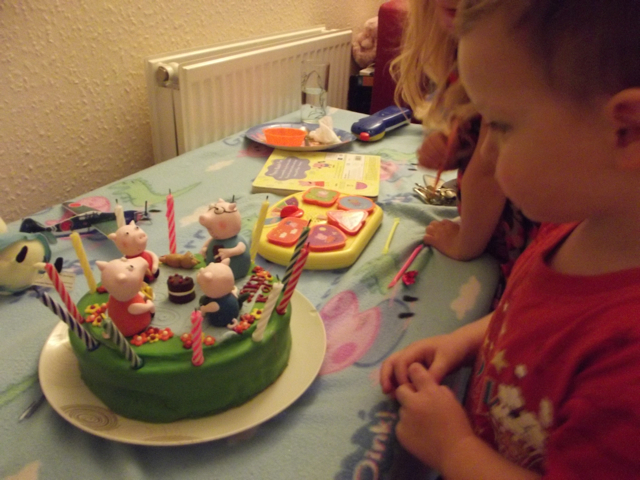 No doubt that each year his birthdays will become more elaborate and more expensive! If you have any other great party tips please comment below! Thanks for reading. What a lovely party! I especially love the beautiful cake! The cake was amazing - Jenna from Pat-a-Cakes is fabulous! I love simple home parties like this! Great tips for throwing a bday party! Impressive cake! 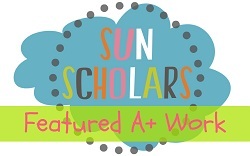 Great list of things to do and love the simplicity of the party! Super cute cake and cupcakes! Thanks for your comment; it was simple, but boy lots of work still, lol! I love your balloon cupcakes. I never think to play things for wind down - excellent idea.